My entry into the Sarah Palin debate generated a link to an article about ph D microbiologist Carl Woese. The article mentions that Woese was behind the new tree of life that reduces the number of branches from five to three. Well, that description misses all the wonder and grandeur of Woese’s contribution. Yes, tree goes from five branches to three, but the three branches are gigantic, and only one of them contains plants, animals, fungi, and protists, four of the branches in the old tree, all tightly bound together. Most of life, Woese tells us, we’ve missed. Anyway, that’s not really what I’m writing about. In the article, Dr. Woese makes the assertion that students shouldn’t learn about evolution until college, essentially because high schools do such a poor job of teaching it. I’m the last to defend traditional school curriculum, and I certainly won’t defend the No Child Left Inspired test-and-punish approach currently in vogue. But Woese misses the point that to get kids to go to college, to go into these fields such as microbiology where they can really start learning complex ideas like evolution, they must first want it. The ideas of evolution – of the universe, of life, and of ourselves – have just such inspirational power. The story of evolution is epic, grand, and stirs the soul. To eliminate it from school curriculum leaves that curriculum that much less inspiring. Nothing in biology makes sense except in the light of evolution. 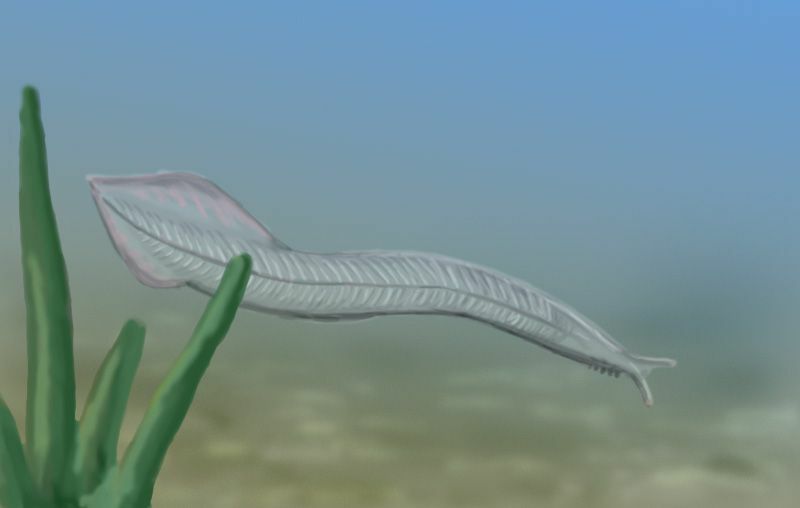 What is left in biology, then, if evolution is removed? What’s left is rote memorization, and we have an abundance of that already. But Woese is right, too. He’s right that the evolution taught in schools is bad evolution. I have so many problems with traditional school education that I’ll never get through it all in a thousand posts, let alone one. To me, school is like this. Someone said, “You know, we really need to educate our children so that they can become productive adults.” Someone else said, “Yeah, that’s a great idea, let’s start a school.” OK, now we’ve got a school. We need money. Let’s gather in some money through taxes. Oh, wait a minute. If we’re going to get tax money, we’d better prove that we’re actually teaching something. How do we do that? I know, we’ll test students. That will show how much they’ve learned. “But wait; it’s really, really hard to test understanding of deep and complex concepts like evolution. That’s ok, we’ll just pick out some facts that arise from the deep and complex topics. If students can recite the facts, then that indicates understanding of the deep and complex topics, which is what we’re after in the first place. The situation reminds me of the person looking for a dropped watch under the street lamp. “Where do you think you dropped it?” “Down the block, but the light’s much better here.” Standardized tests of facts are bound to show us something. The light’s better there. But they don’t show complex understanding, and that I think is what Woese is (rightly) criticizing. So what’s the answer? I believe the answer is teaching. Teach for understanding. Teach so that your learner can become a teacher to others. Teach to inspire. I have no idea how to test that, but I know when I’ve done it. I can see it, feel it, almost taste it in the air. Inspiration is real, it’s powerful, it’s my drug, and it’s available to everyone, not just ph D microbiologists. Today John McCain announced that Alaska Governor Sarah Palin would be his running mate in the presidential race. One of the first things I learned about Palin is that she has commented favorably on the idea of teaching intelligent design creationism alongside evolution in high school biology classes. I don’t really want to write about intelligent design on this blog. But it’s bound to come up from time to time, and the day of McCain’s choice seems as good a time as any for my first mention of it. So here’s what I think. I think evolution is hard. I think evolution is just about as hard, in its own way, as quantum mechanics, relativity, and other aspects of modern science that we all know and admit are so difficult for people to grasp. I’m a teacher. Concepts that are hard to grasp are what I’m supposed to be all about. When we’re trying to teach some bizarre, fantastic, and utterly baffling idea in physics, chemistry, and so on, we don’t get angry if people don’t get it. We don’t get condescending, because we know that is a sure turn-off. Instead, we ask questions. We use examples. We let our learners touch, smell, feel, experience. We use humor whenever we can. We’re gentle guides, not battering rams. Yet when we “teach” evolution, we so often devolve (ha!) into demagogues. Why don’t we take the same gentle educational attitude toward evolution? I’m a huge Richard Dawkins fan. I love his writing, and this essay is one of my favorite pieces of science writing ever. But when I saw Professor Dawkins go toe to toe with the evangelist (I forget his name) in his “Root of All Evil” video, I winced. I didn’t see a gentle guide, I saw an angry old man. I feel like that in that moment Dawkins forgot that he is a teacher (a fantastic teacher), and became, in that moment, something else. Evolution is hard. Teaching it requires a gentle hand, a guide who can lead learners around the pitfalls, past the snares, and into true understanding. One must be careful with learners. One must let them discover. I’d like to teach Sarah Palin. Maybe she wouldn’t listen. That’s fine. As I’ve said before, I can’t teach everyone in the world the wonder and magic of science. I have to find my starfish. Maybe Sarah Palin would just roll her eyes, or argue or, more likely, give a politician’s answer. But maybe, just maybe, I could make a difference for her. I’d like to show Sarah Palin how the wonder of science and the amazing truths of evolution are all around us. I’d like to tell her about the giant star that exploded so long ago, blasting into space the elements that would one day make up her, me, and everyone she knows. I’d like to tell her that she was once inside a star, shining out over the universe. I’d like to tell her about an underdog on one small planet, a tiny creature called Pikaia gracelens that, though surrounded by creatures fiercer, more powerful, and more numerous, somehow survived and passed its genes on to creatures who would become the first fish. I’d love to tell her about tiny mammals, living in the shadows of the great dinosaurs, all the while biding their time and waiting for a chance. I’d love to tell her of a small, upright ape that learned to use its brain, that learned to work with its fellows, to survive, against the odds, in a new and hostile environment. And then I’d love to tell her about herself, a creature so improbable as to seem unreal, and yet there she stands, a living being able to explore the nature of reality, contemplate life and death, and dream of journeys to the stars. I’d love to tell her that she, Sarah Palin, is one of the things that the universe can make. We are stardust contemplating stardust. We are the universe’s expression of itself. What an amazing gift life is, and what an unprecedented chance to learn all we can about this incredible world in which we live. It is our priviledge, our honor, and I believe our responsibility to do so. Maybe Sarah Palin wouldn’t listen. But maybe she would. And that’s what teaching the wonder of science is all about. I’m a sucker for the starfish story. Yes, its corny and overdone, but so am I. Okay. A writer likes to walk on the beach each morning before he begins his writing. One morning, he sees a figure dancing in the distance. Liking the idea that someone would dance to the day, the writer approaches. 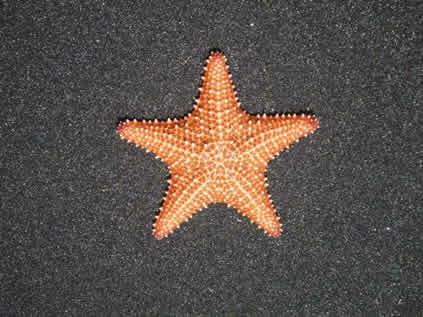 He realizes that the figure is that of a young girl, and she is actually reaching down, picking up starfish from the still-wet sand, and throwing them into the ocean. As he draws near the girl, he asks her what she is doing. “I’m throwing starfish into the ocean,” she replies. I can’t teach everyone in the world the wonder and magic of science. Most people just pass me by. And that’s fine. I like Joseph Campbell’s idea. He didn’t believe in learning something just because it’s supposed to be important. For most people, science will always be what warms their morning coffee, and wonder will be what goofy name the celebrity of the month gave her latest baby. Whether anyone can hear you or not. I don’t intend on writing about COSI much here, but COSI will undoubtedly slip in occasionally. Today at COSI I was teaching our radio demonstration. After going through the three pieces of the demo, each more spectacular than the last, I got to the end and said, “You’ve just discovered the invisible!” The little girl’s face lit up, the kind of expression that is unmistakable, but that I don’t know how to measure on any standardized test. That little girl may not have learned much about radio waves today. She may not remember what the demonstration was about. It may not ever help her pass one of these crazy No Child Left Inspired standardized tests. But I believe this. I believe that in that moment, that child loved science. She loved what she was experiencing, she loved the world, she loved being alive. Maybe tomorrow that experience will be all gone from her mind. Or maybe, just maybe, I made a scientist today. Either way, for that moment, she and I saw eye to eye. For that moment, we both agreed that science is, in every sense of the word, wonderful. Science is full of amazing stories. I’ve written about some of them in some of the articles I’ve done for magazines, but there are always more to tell. For me, these stories stir the soul. There’s something magical about understanding a deep connection, an unexpected truth, a hidden symmetry. Science and technology can do a lot to make life better. Scientists can cure disease, fight hunger, keep the world connected, produce a new source of energy. But the discoveries of science, those connections and deep truths that cause me to gasp or even laugh out loud for joy, those are the discoveries that make life worth living. In 1928 George Gamow, an immigrant scientist from Russia, discovered how alpha particles escape the nucleus in radioactive decay. Here’s the story. Alpha particles come flying out of certain atomic nuclei. When a uranium 238 nucleus, for instance, shoots out an alpha particle, the nucleus changes into thorium 234. Thorium 234 plus an alpha particle weighs a little bit less than uranium 238. Where does that little bit of mass go? Through E=mc2, that mass comes out as energy. The energy is essentially constant for each kind of radioactive atom. But here’s the puzzle. It takes a lot of energy to get an alpha particle in to a uranium nucleus, a lot more than the energy the alpha particle gets when it leaves a uranium 238 nucleus. If you try to fire alpha particles into a uranium nucleus, you’ll never get one in if it has only the energy of an alpha particle that leaves a uranium nucleus. Why is that a puzzle? Think of the uranium nucleus as a high shelf, and the alpha particles as balls falling off the high shelf. When those balls fall from the shelf, they have a certain energy, depending on how far they’ve fallen. You catch the balls and find out how much energy they’ve got. Now you throw the balls back up to the shelf, using that same amount of energy. You discover, though, that there is no way the balls can make it back up to the shelf with that amount of energy. They fall far short. Alternatively, try throwing the balls up to the shelf. Measure the energy needed to get a ball up to the shelf. You find the amount is far more energy than the balls have when they fall off the shelf. How did the balls get down to the ground with such little energy? So that’s the puzzle. How did the alpha particles get “off the shelf” with so little energy? Here’s Gamow’s answer (two other scientists named Gurney and Condon came up with the same answer at around the same time). The alpha particles aren’t particles. They’re waves. Think of an alpha particle inside the nucleus as a smeared out wave. A wave of what? A wave of probability! So almost all the time the wave is inside the nucleus, and it can’t escape. But very rarely, the alpha particle might find itself outside the nucleus. When that happens, the positive charge of the alpha and the positive charge of the nucleus push against each other, and the alpha flies away. Here comes the amazing part. If the alpha appeared in the wrong place, it would fly off with too much energy. It would be as if the ball fell off the shelf and hurtled to the ground. But remember where the alpha energy comes from: it’s from the lost mass of the nucleus. That lost mass is too small to give the alpha energy to fly away from the edge of the nucleus. If that happened, energy would have appeared from nowhere. Nature’s solution is beautiful and elegant. The alpha never appears at the forbidden distance. It appears only at one spot, just exactly far enough away from the nucleus to get just the energy available from E=mc2. No more, no less. It’s as if nature is covering her tracks, hiding all the internal workings of the decay process and fixing the game so that the alpha always, always has just the energy available from the lost mass. It’s very much as if the balls had suddenly appeared midway between the shelf and the ground. How did they get there? They just appeared there, without ever being in the space between. This idea, called quantum tunnelling, appears again and again in modern science. It explains a whole host of behaviors, including why you’re able to twist two copper wires together and get electricity to flow through them. With radioactive decay, though, there’s even more. Because the alpha wave is a probability wave, we can never know just when the alpha decay will happen. It might be tomorrow. It might be ten seconds from now. It might be ten billion years from now. There is absolutely no difference between the U-238 nucleus that decays tomorrow and the one that decays in a billion years. They’re exactly the same. Yet somehow the decay happens, regularly, like clockwork, just as it must, just as it has for billions of years. The 2007 nesting season was a bad one for loggerhead sea turtles all over Florida. In Pinellas County, where my family and I like to spend our vacation, there were only 38 nests all last year. 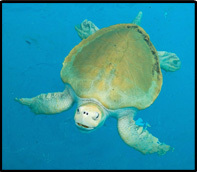 This is bad news, as Florida is one of the two most important for loggerhead turtles worldwide. So folks at the Clearwater Marine Aquarium were holding their collective breaths for this year’s nesting season. Thankfully, it looks a lot better this year. You can track nests at the Clearwater Marine Aquarium’s web site. With the nesting season winding down, so far there have been 107 nests! There’s no information on what species the hatchlings are, but past history shows that almost all of them are loggerheads – a few are greens. By the way, of the five nests I found on my nest quest, all five have now hatched, with 374 baby turtles in all. Only about one in a thousand baby turtles survive to adulthood, but my thoughts are with them. Good luck, babies! 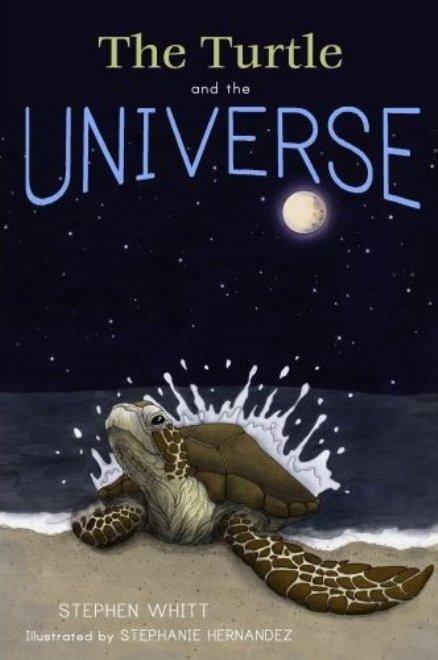 So I wrote this book, called The Turtle and the Universe. I wanted to show how all science is one thing. As a kid I read lots of science books, and immediately the writer became an authority for me. I worried, though, what if all these authorities disagreed with one another? What if the astronomy authorities disagreed with the biology authorities, who disagreed with the geology authorities? Were these authorities all filling my head with contradictory ideas? I think a big part of my science self-education was convincing myself that this was not the case, that in fact all of modern science held together in an elegant and self-consistent way. I wanted to show that with The Turtle and the Universe. I realized that I could tell this amazing story using, not humans and human-centered things, but rather using sea turtles. Not only are sea turtles (like us) made of stardust, but they are ancient and fascinating creatures that appear again and again in our mythology. In addition, like the universe itself, sea turtles take epic journeys in their lives, from their frenzied births from sand, to their journeys into an unknown ocean, to their return to that same sand to give birth to the next generation of turtles. The book has been greeted with a deafening, overwhelming, undeniable silence. A marketing genius I’m not. It isn’t a Harlequin Romance, that’s for sure. Some of the science can be challenging, especially for the targeted age group. But I hate these books and movies that talk down to kids as if they’re little idiots. Kids are smart, they’re just less experienced. In this book I tried to give them some experience. Oh, well. At least my local library is carrying it! I’m a physical science person. My training is in physics and math education, and as a science museum professional I base most of my work on the easy-to-demonstrate physical properties of matter rather than the much harder to show properties of the living world. Yet I write about turtles. Why? One reason I think is something that happened to me when I was maybe 3 or 4 years old. I grew up in Columbus, and we have these city parks with concrete ponds (no not swimming pools, we’re not that much in the sticks; these are real ponds lined with concrete, with concrete sidewalks all around). Anyway, one day my mother had taken me to one of these parks, called Goodale Park, and as I was walking around this nasty old pond, a turtle stuck its head right up where I was looking and said something like “blurdup.” Looking back, I think it was just the sound of the water splashing, but at the time I thought the turtle had burped at me! That pretty much hooked me, and I’ve been fascinated with turtles ever since. 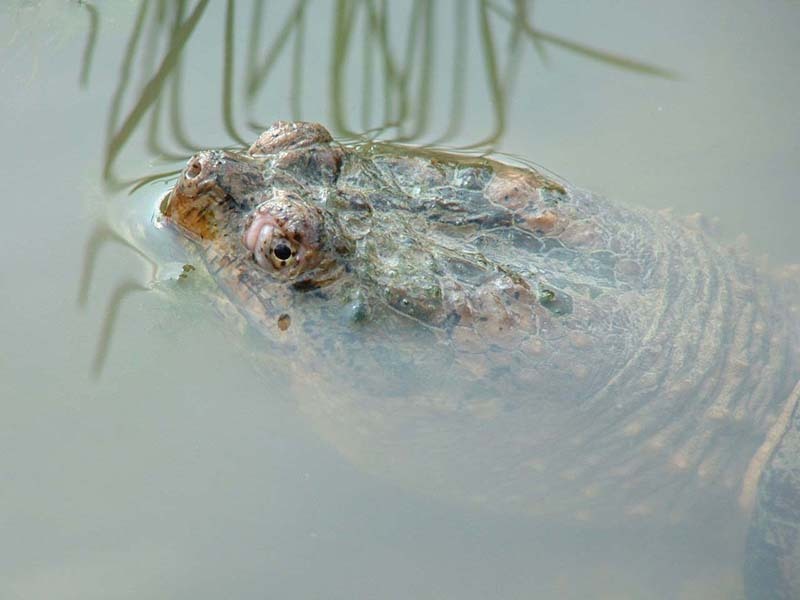 I can’t be certain; maybe I’m just enhancing an old memory, but I think the turtle was a common snapping turtle, like this one. If not, enjoy anyway. My family is the most important part of my life. I have a smart, funny, incredibly wise wife who also happens to be amazingly beautiful and is the love of my life. I also have two witty, inquisitive daughters who are my greatest joy. I’m incredibly lucky and I don’t know what I did to deserve such luck. After my family, the highest priority of my life is learning and teaching about the world. Teaching and learning is at the heart of everything I do, whether it be in my writing, my work at COSI, even my vacations and trips with my family. Although I believe that everything (everything) can be interesting if you look deeply enough into it, I’m mostly interested in the deep connectivity in the world. I don’t mean some mystical, non-physical connection. I mean the connections revealed by science. I believe that the universe is an amazing, remarkable, surprising, deeply mysterious mess, and it is our lucky pleasure in our brief time of consciousness to learn all we can about this universe. That’s what I mean by “a sense of wonder” in my blog title. I hope to write about some of those wondrous things here. Here’s just one example. Hold a tree limb in one hand. Hold an acorn in the other. We all know that acorns grow into trees. But when they start, acorns are tiny, much smaller than the trees they will become. Where does all the “tree stuff” come from? The surprising answer is, trees are built mostly of air. 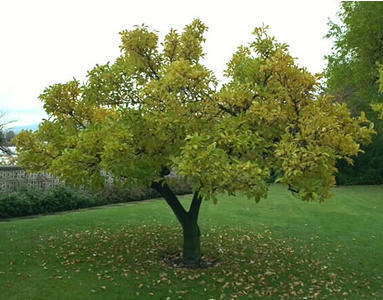 A tree takes carbon dioxide out of the air, adds in hydrogen from water, a trace amount of other chemicals, and binds it all together with the energy of sunlight to build all the stuff that makes it a tree. A tree is a machine that turns air into tree! This is the sort of grand idea that is so often missed by test-based science education. Students might learn about the carbon cycle, about photosynthesis, about all the details of the process, but at the end they can’t recognize this simple and profound fact. They literally miss the forest for the trees. But it is these grand, connecting ideas that are at the heart of science, the reason we do science. They are what give us that sense of wonder that makes the heart leap and the imagination soar. Think about it the next time you’re in a forest. You’re literally surrounded by solid air, by air that’s been condensed and solidified over tens, hundreds, or even thousands of years into wood. Life changes the universe, molds it into unique, amazing, highly-ordered structures like trees. The universe is an amazing place, and it is our priviledge to learn about it. One of the my favorite places is The Clearwater Marine Aquarium. It is a fantastic place where rescued dolphins and sea turtles find a safe home. My wife adopted a Kemp’s ridley turtle named Max for me a few years ago. Here’s a picture of Max. One thing the folks at CMA do is mark and protect sea turtle nests up and down the beaches around Clearwater and St. Pete. On the CMA website, you can see all the nests that have been found this nesting season, and an update on hatchlings. 2008 has been a really good year for nesting loggerheads and, after a disappointing 2007 season, that’s wonderful news!